Publisher: U.S. Brewmasters Association, 1900. Hard Cover, 98 pages, 10.75 x 8.00. In 1900, the annual convention of the U.S. Brewmasters Association was held in Buffalo, New York, and this gorgeous book was given to attendees as a souvenir. 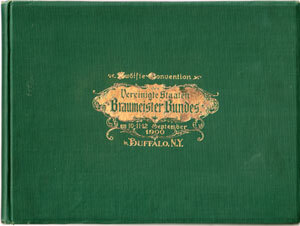 The dark green cover has a nice gilt-stamped emblem that reads, "Swölfte Convention des Vereinigte Staaten Braumeister Bundes am 10-11-12 Septmeber 1900 in Buffalo, N.Y." (translation: Twelfth Convention of the United States Brewmasters Association on September 10-11-12, 1900 in Buffalo, N.Y.). As with virtually all publications of the U.S. Brewmasters Association of this era, this book is written entirely in German. The book includes the program of the convention proceedings, portraits of association officers, portraits of numerous Buffalo brewers and brewmasters, and dozens of beautiful old advertisements for Buffalo breweries (see the list below) and brewing industry suppliers. The book concludes with a history of the city of Buffalo, illustrated with more than 30 photographs of the city.